If there is one thing that can keep car-loving littles occupied for a long time at a stretch, it’s playing with their Hot Wheels and Matchbox cars! While it can be fun to zoom them anywhere around the room, including over the furniture, it’s even more fun when there is an actual road to drive them on! 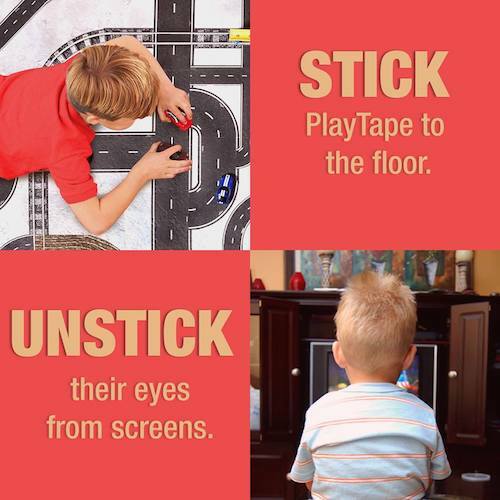 Printed to look like a road, PlayTape Classic Road Series is a roll of removable tape that’s just perfect for playing with your little one’s toy cars. It’s the fastest way to create roads for imaginative play, display, or even for decoration. You can make instant roads, anytime, anywhere! PlayTape has been specifically designed to bring hours of imaginative entertainment at minimal cost and maximal convenience. With just one roll of PlayTape Classic Road Series, you can create a road or even a whole city. Use the toy cars you already have to drive on PlayTape. Use the blocks and toy buildings you already have to build a town through which traffic flows on your PlayTape roads. The possibilities are just about endless! · Ideal for creating roads for playing with toy cars, trains, etc. · Repositionable – mistake proof! · Easily stored and transported. Take fun everywhere! Where to buy: Available at Walmart. This looks easy to use and something that my son would have many hours of fun with. You can buy the tape individually so you can make the road as big as you would like. This looks like a great way to let my son be creative. I love that they are easy to remove and easy to tear! This would defintely keep my son distracted from electronics, in fact my daughter and whole family would enjoy this! My nephew would be playing with this if I win. I would be playing this with my son. Looks like a winner! I learned that the tape sticks to any flat surface and is easy to tear and reposition — no residue and it’s recyclable. I like that it’s 100% made in the USA. I learned this can stick to walls, etc. without causing any damage. My 2 grandsons would play with this and enjoy it. This sounds fabulous. My grandson is crazy about playing with his cars. He has a mat thats small and is always rolling up. He could change this roadway without leaving residue. Love that it won’t ruin your floors! My daughter would play with it. We made her a painted plywood ‘town’ for her Matchbox cars, with roads to drive around in, but this would be even cooler since she could create and re-create the layout herself. I learned that it sticks to any flat surface and is repositionable, making it mistake-proof. It got a 5 star review too. This is so neat! My kids would love this!! What a great product! I like how it will stick to the walls. So cool. THank you! I would be playing with my 2 grandson age 6 and 1/2 and 2 and 1/2. My cousin would enjoy playing with this. All my kids would love playing with this. My grandson would loves this. He plays with his cars all the time. My 7yr old loves his cars. We’ve dwindled down a lot of toys, but the cars always remain. If I won I’d be playing with this with my nephew. He would get a huge kick out of it. My nephew will be playing with it if I win. My niece would have a great time with this. i would love to have this for our son. he would love it. it looks like a lot of fun. If I win this will be for my nephew. This would be fun for my and my granddaughter. It comes in different colors, the tape is 2 in by 15 in long. It has extra curved tape you can purchase as well. I learned that it sticks to any flat surface for instant track or roadway building. My nephews would love to have this for their cars. I would give this to my grandson. He is 5 and always has a pocketful of toy cars. I love that it is easy to remove. And it won’t hurt the floor. Genius! My son will be playing with it. I will play with my 4 year old son. my 2 boys would love this!!!! I love how they are easy to remove and easy to tear! Great for the kids to go nuts making all sorts of roads! I learned that this product exists. I have never heard of it, but will probably buy some for my Grandson for Christmas! Thanks. my 3 y/o son would love to play with this! All three of my girls would love to play with this! My 5 year old son would love to play with this. Sticks to any flat surface for instant track or roadway building Simply pull up to reposition or remove Tears to any length looks like so much fun my kids would love it. My grandchildren will be playing with them if I win!